These inexpensive accessories will change your life (or at least your commute). Your vehicle is your sanctuary. It’s where you can escape the world, turn on your tunes and take the back roads to drive the stress of the day away. We tend to do our best thinking behind the wheel. But a cluttered or messy car (just like your home) can be distracting and stressful. These five car accessories will turn your vehicle into your new favorite place to unwind. Best of all, each one costs less than your lunch at under $20. This cleaning gel ($9) is a quirky way to clean your car vent and dashboard. It also doubles as a handy, multi-purpose cleaning tool for your computer keyboard and those stubborn crumbs that get caught there (if eating Oreos while we type this is wrong, we don’t want to be right). The yellow, lemon-scented blob brings us back to childhood and our favorite toys like silly putty and slime. Just take the gel out of its container, press it down on a particularly dusty or crumb filled area and then pull up slowly. Voila! All incriminating evidence removed. Being big fans of 'Shark Tank', we knew we liked this clever tool as soon as we saw it being pitched on the show. The Drop Stop ($19.99) attaches to your car's seat belt catch to close that annoying gap between your seat and the center console. How many times have you dropped your phone, loose change or keys into that gap? It may not seem like a crisis, but reaching in there to retrieve the item while you're driving can be life-threatening. For just under $20, you'll get two Drop Stops in the package - one for the driver's side and one for the passenger. We chose to feature this item because it goes beyond keeping your car clean. It can save your life. A car garbage can like the Drive Bin XL ($17) is something you probably never considered, but once you get one, you'll wonder how you ever lived without it. Keep old receipts, food wrappers and water bottles from cluttering your center console or glove box with this automotive trash bag that easily attaches to your seats. It has a three-gallon capacity, side mesh pockets to store small items and it comes with a starter set of garbage bags. Once the included bags run out, it will fit the grocery bags you've been meaning to recycle and hold them down with side clips. Its magnetic lid can be left propped open or closed on the smellier of your car garbage. These CHITRONIC Car Seat Hooks ($7) will be a game changer for drivers that are lugging around several kids (and all their stuff) or those that need a better space for stashing their laptop bag than the car floor. We also like these for hanging dry cleaning without blocking visibility. The two included hooks are made out of heavy-duty silicone and rubber materials that may even outlast the useful life of your car. Each hook can hold up to 18 lbs and can be installed in minutes. 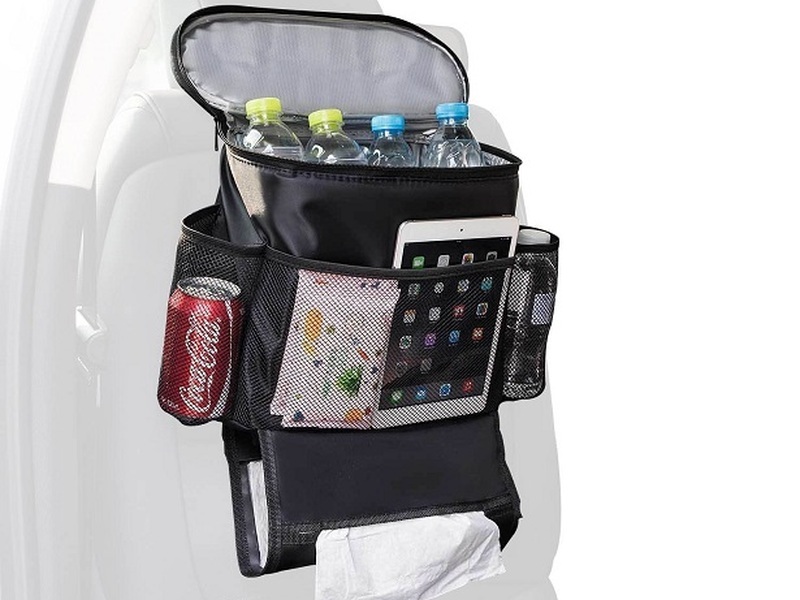 Keep your drinks cold on the go with the insulated Autoark Car Seat Organizer and Cooler ($15). Since it also keeps food warm, next time you get takeout, just stick it in this cooler to keep it from getting cold before you reach home. The cooler is made out of quality, non-toxic materials, measuring 12.6x10.2x5.5 inches and gives you the added benefit of three mesh pockets for storing items like small electronics. One feature that sets this organizer/cooler hybrid apart is the tissue dispenser at the bottom. Just place a tissue box inside and the organizer will dispense tissues as needed. Installing the cooler/organizer is as easy as strapping it to the headrest with the included adjustable straps.